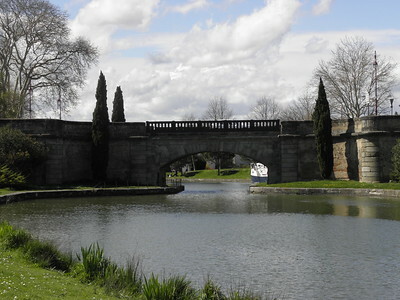 The Canal du Midi is a 240 km long canal that in its time (late 17th century) was a great engineering achievement. The canal is located in the south of France, connecting the Garonne River at Toulouse to the Étang de Thau on the Mediterranean. Four adjoining channels are also included. The original purpose of the Canal du Midi was to be a shortcut between the Atlantic and the Mediterranean, avoiding the long sea voyage around hostile Spain, Barbary pirates, and a trip that in the 17th century required a full month of sailing. Pierre-Paul Riquet designed the canal with monumental grandeur, displaying the power of 17th century France. The surrounding landscape was also taken into account: the canal was framed by trees and plantations. How to "visit" this Canal, that stretches for over 240km and is visible right from the highway a number of times? I decided to have a closer look at two separate places: Castelnaudary and Toulouse. 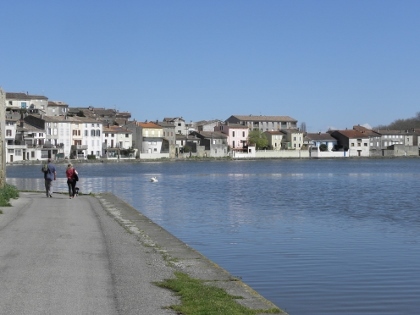 Castelnaudary is a small town with a large manmade lake, the Grand Bassin. This is the largest open body of water within the canal, and also the site where its official opening took place. It is pretty underwhelming nowadays, just a little harbour with small private boats and swans. In Toulouse I was staying near Canal de Brienne, one of the side canals that is also included. Early Sunday morning I walked on the towpath along that Canal until it joins the Canal du Midi. It's a pleasant and quiet route, mainly used by joggers and people walking their dogs nowadays. Just as at Castelnaudary, there's not a lot to see except for the straight canal and the trees closing it in on both sides. One could argue that you can do Canal du Midi justice only by renting a boat to navigate a portion of it. On the other hand, the canal itself is uniformly the same narrow strip of water at any point of its stretch, only the surrounding scenery may vary. Finding myself in Toulouse and having only a couple of hours to spare in August of 2017, I figured I'd stop at a few random points along the canal and call it a reasonable visit. The first stop was in the center of Toulouse, between Boulevard des Minimes and Boulevard Matabiau. The canal there looks like any stream in an urban setting, nothing too exceptional. I then drove to the edge of the city, to the municipality of Ramonville-Saint-Agne, where the canal touches a small marina of Port de plaisance de Port Sud. On this stretch, boats and barges line one side of the waterway, while the north bank becomes a walking and biking path. Further southeast, in Donneville, the canal fully assumes rural features, dissecting fields and rolling by small villages. On the north bank, the walking/biking path is paved, while on the south bank there are unpaved car tracks. Finally, at the edge of Ayguesvives, I came across canal locks. Here, the scenery became really picturesque, and I spied couples and families enjoying idyllic tranquillity. The picture is from this stop. I also stopped at the Port-Lauragais Service Area on A61, which allows pedestrian access to the canal and has an exhibition pavilion dedicated to it. But it was too late in the day to see the exhibition, and I did not think another look at the canal itself would add anything to my impression of it. Overall, I feel that taking a first-hand look at Canal du Midi does not add a lot in terms of appreciation of this feat of engineering beyond what you can gather from reading about it. Subsequently, if you don't have time for a boating cruise, making a short visit to a random point on the canal is entirely sufficient for "seeing" it. That being said, a boating cruise is still something on the list for my future visits to Occitanie. We have made two Canal trips in France the latest during Aug/September this year. Although we love the experience, we were horrified to discover that boat effluent is being dumped in the waterway. This was not our understanding as we were told that the toilet mascerator separated solids from liquid and this was disposed of at port dumps. Unfortunately, this is not regulated and often we heard that people were told to just dump their toilet into the Canal.This is an UNESCO World Heritage site and as such, one would assume care of the Canal would be of prime importance. Obviously, we realise now the reason for the putrid water. The Canal du Midi was one of Europe’s major construction projects prior to the Industrial Revolution, and even though it never really fulfilled its promise of being a major artery of the French economy and is today mostly used by house boats ad other pleasure boats, it is still quite a fascinating achievement. Unless you take a cruise, though, you have to be content to visit it in bits and pieces. I went by train from Montpellier to Toulouse, and from Narbonne onwards, you can see it from the train in many places; the motorway also runs alongside it. In Toulouse, the starting point, you can walk alongside the canal for a long stretch - the main train station Matabiau is right next to it, and a statue of its mastermind Riquet can also be found in the area. Also, the Canal de Brienne, a side canal connecting it to the Garonne River, makes for a pleasant walk. Visitors to Carcassonne will find that the canal is also next to the train station there. Halfway between Toulouse and Carcassonne, the huge basin at Castelnaudary is also an interesting sight, as it is the largest body of open water on the canal (about 7 hectares). For casual visitors, this is probably the one of best spots to see the canal, but to really enjoy it, a boat ride is likely to be preferable. How to visit a canal of more than 240 kilometres in length - indeed a good question. The classical way is to navigate the canal by boat. But that would take several days, and I'm afraid it might be a bit boring after a while. Another option: by bicycle on the old towpath along the canal. Would be more appealing to me, but it would also take a few days to see a substantial part of the entire stretch. So we decided to visit the Canal du Midi by car on our trip from Arles via Carcassonne to Toulouse. After a bit search in the web I identified some structures that seemed to be the most interesting, and thanks to my tom-tom it was easy to find them. First we headed for the round lock at Agde, a basin with three gates that connects the canal with the Hérault River. Next we went to the Ouvrages du Libron, a complex system of gates and walls to protect the Canal du Midi from an overflow of the river Libron at high water. Normally, the levels of the two streams are very similar, so that a conventional aqueduct was not applicable. The construction is a jumble of slide gates, ring gears, bars and chains. The principle is that the river is split in two streams, which cross the canal through separate aqueducts. By closing the gates successively a boat can safely navigate through the section. There are explanatory panels, but I'm not sure if I understood all the technical details. It would be interesting to see how the facility operates at high water. The massive Orb Aqueduct in Béziers is a later addition, it was built in the 19th century and is the longest bridge on the Canal du Midi (240 metres). In Béziers is also the steepest section and the most spectacular place on the Canal du Midi, the Fonserannes Locks. With eight successive chambers and nine lock gates a boat can be lifted a height of 21 metres at a distance of 300 metres. It was fun to watch how a hobby skipper finally managed to steer his boat through all the lock chambers. From step to step it worked better - learning by doing with success. And all under the eyes of about 50 spectators which gave good advice. Malpas tunnel, the first navigable canal tunnel in Europe; Le Somail, a picturesque hamlet, once a stop for mail ships, some buildings, a chapel and an old stone bridge have been preserved; The Argent-Double Aqueduct, also an overflow to the Argent-Double river; a triple lock and the Orbiel Aqueduct in Trèbes. The photo shows the lock in Homps where we had a sumptuous picnic. 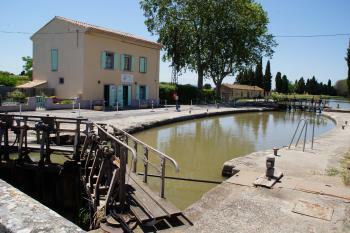 It is a typical place at the Canal du Midi, the technical facilities of the lock seem unchanged and also the lock keeper's house has been preserved. As with all locks on the canal, the chamber is oval, the curved walls better withstand the water pressure. This was one of the great technical innovations by Pierre-Paul Riquet, the engineer of the canal. We stayed in Carcassonne, and the next day we went to the Bassin de Saint-Ferréol, the main water reservoir of the Canal du Midi. A major problem was to supply the canal with sufficient water throughout the year. The idea was to collect the water from the rivers of the Montagne Noir in a large reservoir. From there a canal, the Rigole de la plaine, feed the Canal du Midi at its highest point at the Col de Naurouze. Today, the construction is not very impressive, but in the 17th century the dam in Saint-Ferréol was the highest in the world. But to be honest, our main goal was not the dam but the nearby town of Revel, every Saturday there is a wonderful market in and around a medieval market hall. We also visited Castelnaudary, the highest point of the canal at Col de Naurouze, and the junction with the Garonne in Toulouse. We enjoyed very much our trip along the Canal du Midi. It was a calm and peaceful atmosphere, the time seemed to pass more slowly than elsewhere. During the two days, we saw only about a dozen boats, but the ports were full of boats, suggesting that the canal may be quite crowded in high season. The structures and technical facilities might not be very impressive for today's visitors. But one have to take into account that most of the constructions date from the 17th century and were built with rather simple equipment. Riquet and his engineers had to find innovative solutions for the water supply, the flood protection, the rivers that cross the canal, etc. 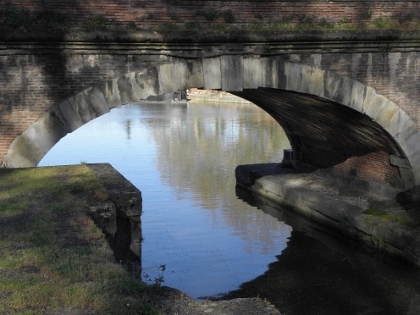 The Canal du Midi is a masterpiece of civil engineering - and it works until today. I visited this WHS in February 2014. Since I was based in Carcassonne, I first enjoyed an afternoon walk by the juniper tree-lined canal with its bridges and locks near Carcassonne. Later on I visited the Canal du Briennes near Toulouse and pretty much had the same experience there too. For a change, I opted to visit the Grand Bassin of Castelnaudary where there were much more boats, a small river island and a different view of the Canal du Midi. At Castelnaudary, I found an informative explanation of why the Canal is so important as an engineering feat and as a WHS. I finished off my visit with a great Cassoulet at Le Tirou, the number one restaurant in town if you want to try the best cassoulet ever! In our trip to France we have seen the Canal du Midi, built between 1667 and 1694, that is 240 km long (360 km with his four lateral canals) and in average 18 m large and goes from the Étang de Thau on the Mediterranean coast to Toulouse, where flows into the Garonne, that goes to the Atlantic: it links the two seas and has 328 structures (locks, lifts, aqueducts, spillways, bridges, tunnels). Its architect Pierre-Paul-Riquet was a tax collector from Béziers and presented his project to the minister Colbert and to the Versailles court: only the king Louis XIV believed in him because he thought that it was the ideal connection between the port of Séte, that was under construction, and the ocean. 12000 men worked here and Riquet became its architect and had to have many capacities. When money didn’t arrive from the court (the project cost 15 million libras) he had to spent his; he died before the canal was finished. He was conscious that he was creating a symbol of the power beyond a functional communication wateway: he ensured the quality of the architecture and the works were designed with monumental dignity and simplicity. He was also very conscious of the impact of the canal to the landscape, so he planted trees and plantations along it. We have seen the beautiful canal at Fonséranes, near Béziers, where are nine lifts that go over 25 m and are 315 m long, a port and a bridge, that makes the canal cross the river Orb. I liked very much the lifts and the bridge because of the quality of the architecture and their working, that I have admired when a boat passed them. It's worth to be visited if you are in the Midi-Pirénées and justifies the incription also because it's the most interesting canal in the world and the only one inscribed. Three of us were on the canal for a week from corbieres to trebes and back with a side excursion by bus to medieval carcassonne. A wonderful trip. Everyt curve in the canal opens a new vista, I draw and paint , filled two sketchbooks and feel the need to return to pick up what i missed. We docked at towns like capestaing and trebes for the night and picked up bread and croissants each day after 7 am when the bakeries opened. Wine , cheese and bread while underway and then to a new village and a restaurant for dinner. All the meals were good. all the people we met were nice and nothing was crowded in mid May. The Canal du Midi is truly magnificent. From the standpoint 17th century engineering, doubtless it must have been regarded then as a miracle. Personally, I think it still is. I’ve had the pleasure of visiting the Canal du Midi three times, although I have never been able to navigate the Canal by boat. A shame. The surrounding countryside is beautiful, with everything Mother Nature has to offer. Vineyards, the beautiful old trees, which are so typical for France. And please, dot't forget, the Languedoc has a very interesting 2000 year old history. You can feel it. And for me as a Northern European, it is very nice to see that life has a different pace along the banks of the Canal. So, visit the Canal du Midi and the Aude region, enjoy it. You will. Oh, and it does smell so nice over there. In for a laugh? 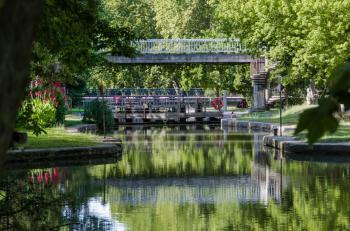 Visit the nine locks of Fonsérannes. The skippers of the rental boats will make it worth your while, mostly not being hampered by any knowledge of seamanship and line handling. 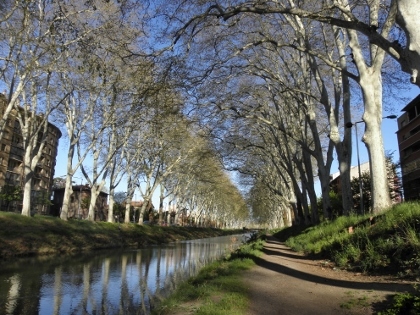 The Canal du Midi is rightly on the list of UNESCO World Heritage. The French can be proud. Little tip for visitors in the neighbourhood of Bezier: a bit to the west lies the village of Nissan, close to the Canal du Midi. You might as well take a look at the Opidum d'Enserun. See for yourself, because it is hard to describe, but I am sure you will be astounded. We were a party of four adults, novices at boating, and one of us (me) didn't like boats or water! We had a marvellous week and I would recommend it to anyone. We decided on the Mediterranean route as this involved less locks (cowards!) but it was what we needed - a leisurely week to appreciate the waterways, food and wine and great weather. We started at Beziers with the plan to reach Aigues Mortes and return - we eventually reached Carnon! Probably because we stayed two nights at Marseillan - a lovely village with really nice restaurants. You need to be aware about lock procedures and also that the bridge at Frontignan only opens three times a day so you need to plan your arrival time to coincide with these openings. For anyone who is not sure whether they can cope with locks, try this route - only 14 to navigate and it's good fun.